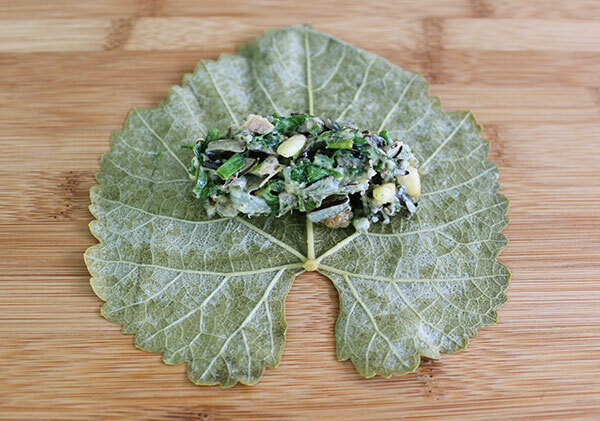 This is our stuffed grape leaves recipe made with homemade lacto-fermented grape leaves rather than pickled preserved varieties. 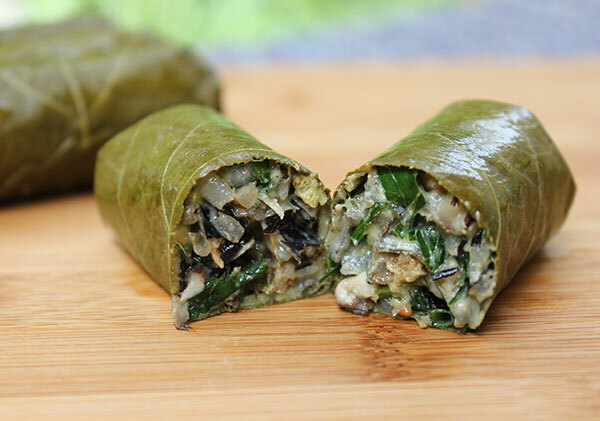 Also referred to as dolmas or dolmades, this one is a Greek variation using some of the common ingredients utilized in Mediterranean-style fillings. If you've never had dolmas you're in for a real treat. They are essentially handy pre-made rolls stuffed with tangy and savory flavors that can be stored in the fridge for several days until you're ready to eat them. Although often served as bite-size appetizers before a main meal, we like to enjoy them as the primary entrée with soups or salads as they are quite filling. While we prefer to make our from scratch, dolmas or dolmades are actually a popular type of canned food, believe it or not, and frequently available in international food sections of most grocery stores in the U.S. and other countries around the world. 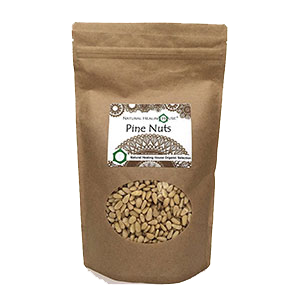 They are usually a product of Greece where they are a traditionally eaten item prepared in many Greek households. 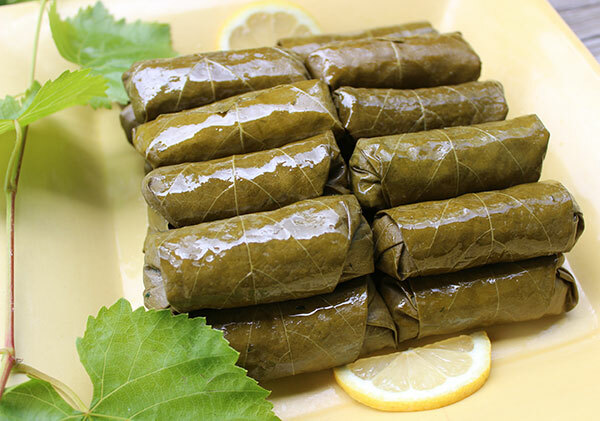 Dolmades, according to Greek custom, may include a wide combination of vegetables, nuts, fruit, minced meat, herbs and seasonings. 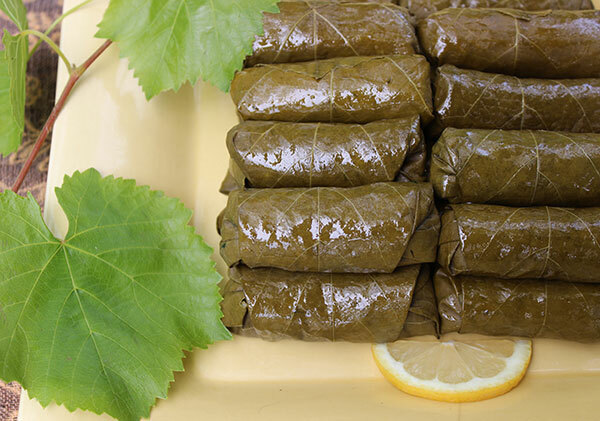 It is believed that the origin of stuffed grape leaves historically dates back to Alexander the Great when they were prepared as a nourishing rolled meal in times of food scarcity. 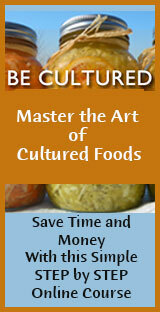 This recipe is a "high raw" vegan version using only three cooked ingredients, wild rice, shiitake and miso. 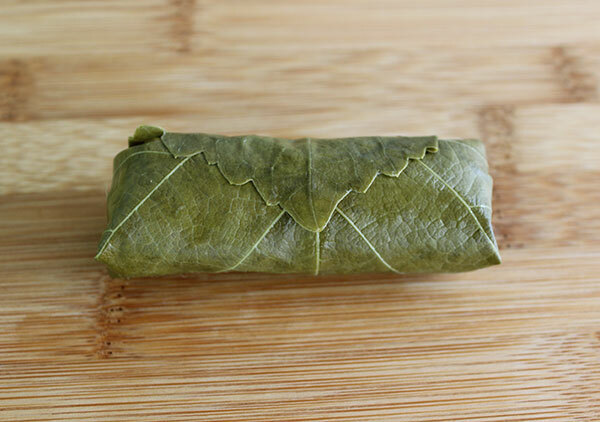 While dolmas are commonly heat treated, usually via steaming, to tenderize the leaves and ingredients, we find that this process isn't all that necessary. The leaves are already softened from pickling and the stuffing we use in the recipe below provides a nice consistency that holds together well when rolled. Unheated dolmas are much easier to digest, in our opinion, preserving beneficial enzymes, probiotic content and other phytonutrients. Most commercial grapevine leaves are preserved as a canned pickled food. This usually involves blanching of the leaves first then preparing them in a brine and hot water bath for further processing. 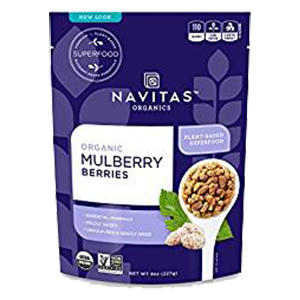 Other ingredients are also frequently added to low quality brands which may include a list of preservatives like sodium benzoate, potassium sorbate and sodium bisulfite. If you do buy canned or preserved grapevine leaves, it is best of course to purchase products without artificial preservatives. There are a few reputable manufacturers who only use a few basic ingredients, usually grape leaves, vinegar water, salt and citric acid. However, if you happen to live in a region where you can harvest wild leaves or even cultivated varieties, you can make your own homemade jar of fermented leaves with only a few supplies and spices. 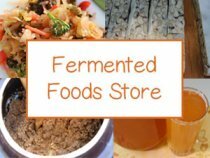 Lacto-fermented grape leaves produce a pickled flavor and soft texture that is similar to canned versions, but also creates a fermented food with beneficial microflora and enzymes that helps to aid the digestion of other foods. When the leaf is fermented for a number of days in a brine solution, it produces a perfectly flexible texture that is easy to roll around foods without tearing. 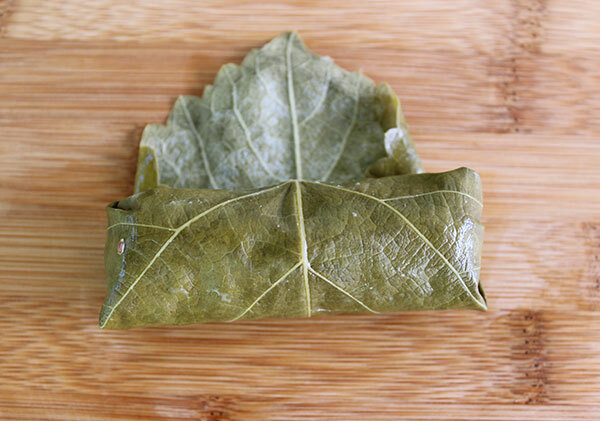 Although the tangy and subtly sweet tastes are especially delicious when used in this stuffed grape leaves recipe, they can be additionally utilized as a burrito-style wrap for a variety of other food fillings. 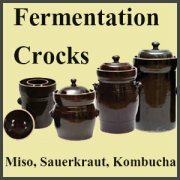 Lacto-fermentation is achieved in much the same way as making other cultured vegetables by submerging the leaves in a brine solution. This oxygen-free (anaerobic) environment supports the growth of desirable bacteria and eliminates pathogenic varieties when kept at the appropriate temperature between 65-75°F (18-24°C). 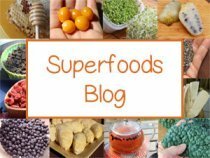 This liquid most always includes sea salt, pure filtered water and pickling spices, but may also be inoculated with probiotic powder or culture starters containing lactic acid bacteria. 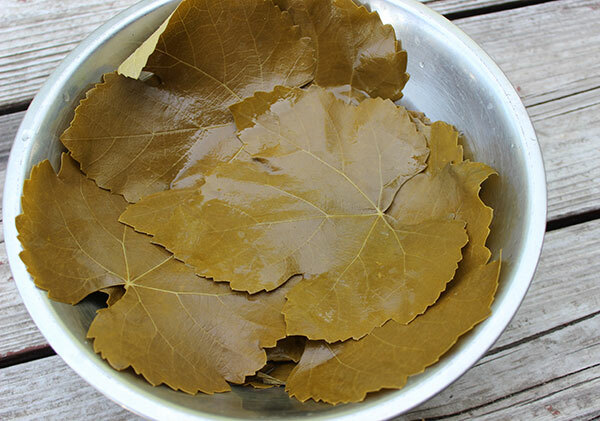 When making your own homemade fermented grape leaves, you will of course need access to a good quantity, at least 30, fresh healthy grape leaves. Wild grapevines grow throughout many mild climates and forests all over the world and essentially can be found anywhere that you can grow wine grapes. They are quite a prolific species, often weaving their way through tall trees and brush, producing many leaves in just one small area of growth. When harvesting your own wild leaves, you will most always find them happily using a plant neighbor to grow on for support. This could be anything from blackberry vines and boulders to pine trees or homestead fencing. Likewise, grape leaves can also be harvested from cultivated garden grapes as well as from wine grape species, but are typically considered less palatable than the wild grape that only bare small fruits. In this recipe you will be making the wild rice ahead of time, then adding your herbs, spices and soaked mulberries. 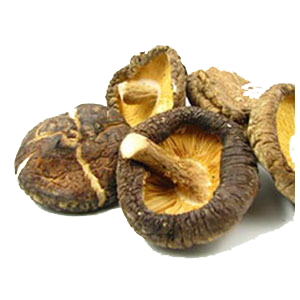 The shiitake mushroom can be steamed slightly by adding it to the rice at the last minute. 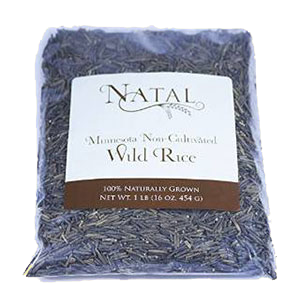 When cooking wild rice, half a cup of raw grain will usually make 2 cups of cooked rice, depending on the variety you are using. We typically like to integrate our other filling ingredients when the rice is still warm, but has cooled for at least 15 minutes. 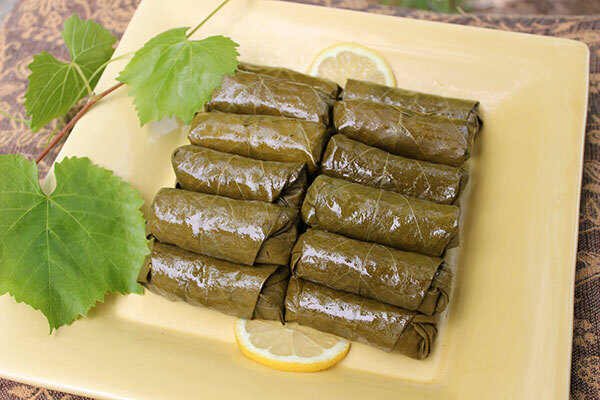 This stuffed grape leaves recipe will fill about 20-25 grape leaves, depending on their size. Prepare the wild rice, add in shiitake during the last 5 minutes of cooking time. Allow the rice to cool slightly in the pot or rice cooker. Remove the rice and place in a large bowl. Thoroughly mix in all the above ingredients, aside from the grape leaves of course. On a clean chopping board, lay down your grape leaf with the vein side up and cut stem at the bottom. 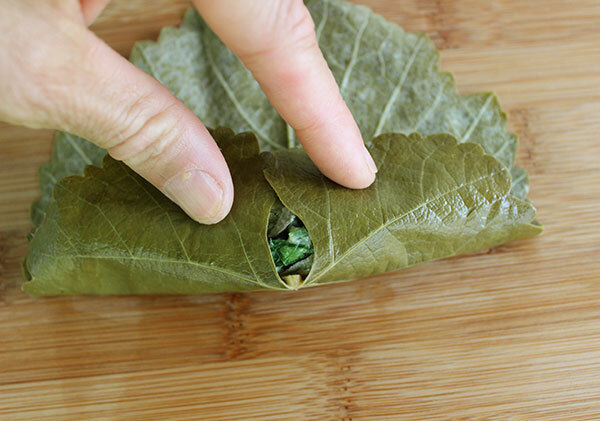 Place your filling (between 1-3T) onto the middle of the leaf, but closer to the lower stem. Sometimes, but not always, grape leaves have two lobes at the bottom that stick out. These segmented sections make it easy to turn up the sides to hold in the filling as you roll it like a burrito. Make sure to roll it as tightly as you can towards the tip of the leaf, constantly folding in the leaf as you move upward. Pack each dolma, as you make them, into a square/rectangular shaped glass dish or plastic container. Brush lightly with olive oil if desired. Store in the fridge for later use or consume immediately when warm. These dolmas can be drizzled with olive olive before serving or you can make a lemon-based dipping sauce (avgolemono-style) or a tapenade, using raw black olives. Enjoy them as an appetizer or as a main meal. The recipe can easily be doubled for potlucks or other gatherings when finger foods are appropriate. 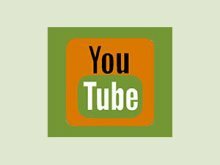 Visit our healthy cooking tips below for ideas on how to make your vegan cooked food entrées more nutritious, or likewise check out some of our raw vegan recipes.